Day tour of New Delhi. The tour includes the India Gate, Lotus Temple, Qutab Minar, Humayun's Tomb. After lunch at a local restaurant, transfer to Safdarjung Railway Station, New Delhi, where a warm welcome will be reserved for guests of the train. Boarding and departure for the fantastic tour. 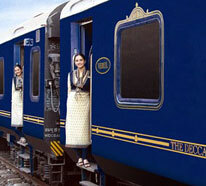 The first stop of the "Palace on Wheels" is Jaipur, one of the most beautiful cities in the world. The capital of Rajasthan, popularly known as the "Pink City" was founded by Maharaja Sawai Jai Singh II in 1727. To explore the city, a car with air conditioning will take you to the "Hawa Mahal" Palace of Winds, which is a remarkable building of five floors in the center of the city and decorated with small windows. Then visit the Amber Fort eight kilometers away, where the tour on elephant's back adds to the ambiance. Back to Jaipur after breakfast, visit the City Palace, still inhabited by the current royal family. Then a visit to Jantar Mantar, the observatory built by Sawai Jai Singh II. Back to the "Palace on Wheels" around 18:30. Dinner on board. You can almost feel the life of the desert, when the "Palace on Wheels" arrives in Sawai Madhopur, a city named after its founder Maharaja Sawai Madho Singh I. After breakfast, a visit is organized in the Ranthambore National Park, where there are the ruins of a 10th century fort. This wildlife sanctuary is considered the best in the country to observe and photograph the activities of a tiger. The park, with an area of 392 km2 is home to over 300 species of birds. The tiger, hyena, badger, jackal and fox are among the species that make up the carnivore population. Back on board the "Palace on Wheels" and start to Chittorgarh. Arrive after lunch on board. Images of love and courage, battles won and lost .... scars three times besieged, Chittorgarh Fort is all this and more. Arrive at 8:00 to Udaipur, the "City of Lakes". The city was founded by Maharana Udai Singh of Mewar, after the Sisodia dynasty was driven from the throne by the Mughals in 1559. The two most beautiful sites of Udaipur are the marble Palace, Jag Niwas, and Lake Palace and Jag Mandir that seems to emerge from the waters of Lake Pichola. After lunch, visit the City Palace which is the exhilarating. Then, visit the Crystal Gallery. 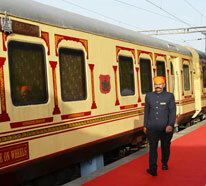 Back on board the "Palace on Wheels" and transfer to Jaisalmer. At the heart of the Thar Desert, is the city of Jaisalmer, founded by Rawal Jaisal in 1156. The yellow sandstone fort that offers an impressive view, superbly dominates the city. Discover the carefully carved havelis and graceful facades. The Nathmalji-ki-Haveli, Patwon-ki-Haveli and Salim Singh-ki-Haveli are fine examples of the skill of the stone carvers. After lunch on board, go for an exciting camel ride in the dunes and enjoy the dinner and cultural programs in Jaisalmer hotel. The train leaves for Jodhpur at night. The next morning, the "Palace on Wheels" is in Jodhpur, a city surrounded by a high wall with pierced stone gates and several bastions. This second largest city of Rajasthan, founded by Rao Jodha in 1459 is known for its unwavering Mehrangarh Fort. The palaces inside (Moti Mahal, Sheesh Mahal, Phool Mahal, Khana and Daulat Khana Sileh) are impressive examples of architectural excellence. 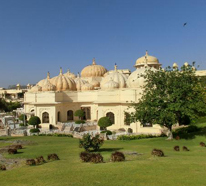 Near the complex lies Jaswant Thada strong, a group of royal cenotaphs in white marble. After lunch in town, back aboard the "Palace on Wheels". Early morning arrival in Bharatpur, the capital of Maharaja Suraj Mal. After breakfast, visit the famous Keoladeo Ghana bird sanctuary which is home to hundreds of species of resident and migratory birds. Arrive at Fatehpur Sikri, the red sandstone palace complex of Mughal style. Within the enclosure is a mosque built by the Mughal Emperor Akbar which is dedicated to a Muslim saint who foretold the birth of a son. After lunch, steering Agra and the Taj Mahal, one of the seven wonders of the world. A monument which represents eternal love. It was built by Emperor Shah Jahan in memory of his beloved queen Mumtaz Mahal. Agra is famous for its stone inlay work in marble. After dinner on board, last night in the "Palace on Wheels" before arriving at the Safdarjung Railway Station in New Delhi at 6:00 am the next morning. Arrival at Delhi Safdarjung Railway Station. Breakfast on board.